*The following product was provided in exchange for my honest review. I have another Cosmprof indie Vegas polish to share with you today. I picked up this one at the Cocktails & Colors event from Pahlish. She had offered a polish of hers to each of us as we visited with her at her table. This one immediately caught my eye. It was eye searing bright pink and that was enough to sell me on it! 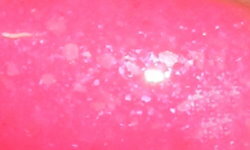 Watermelon Punch is a neon watermelon pink crelly with white, violet, and blue flakies. Color: Pink is not a color I really see celebrated or released in nail polish much anymore. I get it, it's a pretty general color and no very exciting in comparison to others. I love an amazing and innovative pink though and Watermelon Punch is just that. This bright crelly pink with the added flakies is different, fun, and definitely a one of kind pink shade. Formula: The formula on this was a little bit on the thick side. I could still work with it, but I'd prefer if it were just a tinge thinner. I used 3 coats for full coverage. Price: Please don't get mad at me, but this one isn't available anymore :(. This I think was LE for last month and part of a trio of 2 other colors. Overall: I love this creative and fun pink shade. This nail polish brings and smile to my face with just how bright and awesome it is. It also makes me crave more fun pinks like Watermelon Punch. Awesome pinks are possible!